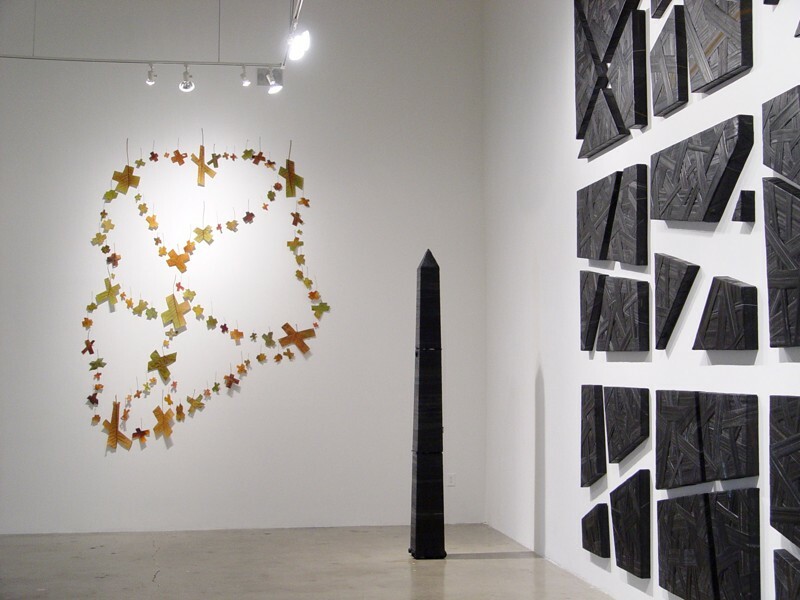 You could say that artist Gregor Turk has two fixations: monuments and mapping. Over a long career working in the city’s art scene, the Atlanta native has often focused on the kind of historical markers that identify Civil War sites or landmark Atlanta buildings. Other work has focused on the kinds of strange icons that dot maps and provide reference points to roads or water features. But in his solo show at the Museum of Contemporary Art of Georgia, “Terminal Velocity,” Turk has brought those two strains of his work together into a far more satisfying whole. Call it the advantage of time, space and an infusion of cash. Turk is the third recipient of this year’s Working Artist Project award, which affords local artists an exhibition at MOCA GA, a studio assistant and a stipend. Part of the immediate appeal of Turk’s show are his materials of choice: rubber inner tubes and the metal car plaques that identify a car as a Cherokee or Mercury. Those materials conjure up a very specific modern reality, one defined by passive visions of exploration, historical touchstones, cars and the Atlanta highway system that reappears many times as a visual motif in “Terminal Velocity. In three works in his “Metronesia Series,” Turk has created maps of the Perimeter and its intersecting roadways. The first map is composed of those metal car plaques arranged to form the Perimeter; the second Perimeter is composed of inner tubes and the third of fall leaves. What remains overwhelming in those pieces is a sense of everything, nature, progress, even the rhythms of life defined by that highway grid. In a driving city like Atlanta, “Terminal Velocity” will hit many of us very close to home. Turk has boiled down the fast-paced, modern world into something elemental and stark, akin to hieroglyphics or cave drawings. The strangest, and also the funniest, pieces in the show are the monuments — also constructed of tire rubber — that Turk has placed in the gallery’s four corners. Like the Washington Monument, Turk’s obelisks sport that familiar spire-form but have all been rendered in black rubber. “The Aggrandizer” is a sad, partly deflated rubber obelisk attached to a bicycle pump for a quick infusion of air. The piece offers a funny riposte to the proud, unassailable obelisk form. Turk takes a similarly humorous road in a series of four works on paper formed from rubbings of those metal car plaques. “Cosmos” for instance, forms its perimeter shape from Pioneer, Aries and Mercury car plaques. “Menagerie” is formed from metal signs for Pinto, Lynx, Bronco and Colt. Turk’s point is that for all that talk of animals, exploration and wild, open vistas in those aspirational car names, we are contained and cosseted explorers, locked within perimeters, stuck on our asphalt tracks. While all parts of the show don’t always gel perfectly, there is an ambition and a grappling with big ideas that marks this as a significant step in Turk’s career. Bottom line: A clever, visually appealing expansion of the artist’s fixations.